“South African City Futures: Visualising the Futures of our Neighbourhoods” is a project that aims to encourage South African cities and their constituent neighbourhoods to start thinking differently about their future. The intention was to implement an innovative project that is part research and part radical co-creation, which combines the use of futures thinking, multi-stakeholder dialogue, and multiple forms of visualisation to reflect upon the future of urban neighbourhoods to 2030. This documentary tells the story of the old Building Club Rialto de Pereira and its importance for the city. Habitat is a movie about relationships over time; relationships between people, and between people and places. In post-earthquake rubble, the past is further away, more visible and more useless. And among the C.A.S.E. settlements, prefabricated housing that is already falling apart, constructed in the middle of nothing, the present is more present: it has no yesterday and it has no tomorrow. The film was shot in Kilamba Kiaxi, a new city built outside Luanda, Angola. The city was built by Chinese construction company, CITIC, and financed by Hong Kong-based China International Fund. The new city is to be home to more than 210 000 people, and is the single largest investment project by China in Africa. By narrating the story of the privatization of state housing in New Zealand through the eyes of two Māori women involved in opposing housing projects, A Place To Call Home examines the new global trend in which social housing is run by private trusts and interest groups who care for specific subgroups within a community. A new secondary school built with local skills and materials and using innovative technologies is a vibrant hub at the centre of a remote rural community. Conceived as a personal video diary, the film takes us to the heart of one of the contemporary housing development considered to be a new model of success. Inhabiting the giant “8 House” built by Danish architect Bjarke Ingels in the suburbs of Copenhagen, Ila Bêka & Louise Lemoine recount their subjective experience of living inside this experiment of vertical village, elected in 2011 “World best residential building”. As a Lego game, the film builds up a collection of life stories all interconnected by their personal relation to the building. The film draws the lines of a human map which allows the viewer to discover the building through an inner and intimate point of view; and questions the architecture’s ability to create collective happiness showing the surprising results of this new type of social model of the 21st century. Please note that this film replaces "Uncommon Sense: The Life and Architecture of Laurie Baker" whose producer/director suffered a tragic car accident shortly before delivering the film to the AAFF. This film will be screened at the next AAFF edition. At the heart of Rio de Janeiro's downtown is an empty square with a dry fountain and an underground parking. This was once the location of the Monroe Palace that housed the Senate and was mysteriously demolished forty years ago. A history of sabers and lions, the military and architects, past and future. *Venue*: Saint-Gobain GAP Urban Lounge, MOAD (Museum of African Design), 281 Commissioner Street, Maboneng, Johannesburg. Urko Sánchez; Mphethi Morojele; Luis Urbano; Doreen Adengo; Issa Diabaté; Thomas Chapman; Lesley Lokko. This experimental work examines the Tirana (Albania) urban context, trying to sketch a critical point of view arising out of the current urban crisis. The intention is to stimulate an experience of participating and feeling responsible for developments happening in the city today. Ecological limits have been surpassed. Economic limits have been surpassed. Population limits have been surpassed. Social cohesion has been lost. In Istanbul, lacking a tradition of principled planning, the adopted neoliberal approach put financial gain ahead of people’s needs; everyone fought to get a piece of the loot. The result is a mega-shantytown of 15 million struggling with a mesh of life-threatening problems. In the heart of Nigeria’s fastest growing city, Lagos, two worlds constantly live out the irony of economic realities. Divided by the popular third mainland bridge, the bustling economic part of the city stands adjacent to MAKOKO – a sprawling fishing community, floating on the waste of the city. Neglected by the government, MAKOKO strives for a place in the fortune and future of the city, by the effort of individuals who focus on educating children who otherwise would not have had any opportunity for formal education. While waiting for the opening of the bathing season, a zealous worker prepares the Leça Tides Swimming Pool, designed by Alvaro Siza in 1961, for the arrival of vacationers. The island of La Maddalena was supposed to host the G8 summit in July 2009 but on April 23 2009, the Prime Minister at the time, Silvio Berlusconi, decided to move the event to Aquila, a city that had just been destroyed by an earthquake. The brand-new complex of the former Arsenal on the island planned by Sefano Boeri to host the event was slowly abandoned. A court inquest followed which revealed illegal management practices involving corruption, fraud against the state and environmental pollution. The film is conceived as an introspective wandering of the architect Stefano Boeri going through the abandoned spaces. Detroit's story has encapsulated the iconic narrative of America over the last century – the migration of African Americans escaping the Jim Crow laws; the rise of manufacturing and the middle class; the love affair with automobiles; the flowering of the American dream; and now, the collapse of the economy and the fading American mythos. These two short films portray the dominant downtown arcade buildings in Kampala, and the partially disused railway line in this city respectively. Through this research, these two sites – arcade buildings and railway line – situated across the city from each other but interdependently linked, were identified as fundamental to urban life. Moreover, the parallels between these spaces of the Kampala landscape will, it is anticipated, become important in understanding how to propose new architecture in the city. Gijon’s Labor University is the ultimate example of monumental architecture during the Franco autarchy in Spain (1939-1959). A boarding school for a thousand children, this socio-educational laboratory enacted the aspired future shape of the country's imposed "New Order". Through fragments of films from the two first decades of dictatorship, this film essays complementary ways to reveal the implications of this building-city, its ambiguous position between utopia and dystopia, and its unique architecture. Fiction is a dimension of the mind that materializes the conscience of what we know and do not. This project is the bringing together of all the frontiers, the principles that make up an individual, his or her relationship with other(s), within a collection in scale and impact, and the conventions and languages by which they can co-exist. In this frontier, Johannesburg is a fictional character and setting within and outside her own ends – history, present, future – a “city en-route”. Roger D'Astous is one of the most important Canadian architects of the twentieth century. A Frank Lloyd Wright student, he worked all his life to define Canadian Nordic architecture. This flamboyant rebel artist once was a Canadian architecture superstar, and then tragically fell into disgrace before being reborn at the dusk of the century. The film presents never seen before projects of Roger D'Astous. The short video shows the emergency bridge in the Chacarita neighborhood in the city of Asunción (Paraguay), built by the collective Aqua Alta to immediately bring relief to a community affected by continuous flooding. A brief visual portrait of the Community Development Center under the plan "Techo", built by OCA (Community Bureau of Architecture) and Bonini Architects, in Luque, Paraguay. Comuna Yerbas del Paraíso, located in Puerto Paraíso, in the province of Misiones is a hostel, meditation and training center, designed by the architecture studio IR. Set in Pretoria, South Africa in 1995, the film concerns an elderly Afrikaans former-civil servant (municipal architect) whom – years after the death of his family in an accident – is the sole inhabitant of a large, derelict downtown apartment complex he once designed. When he accidentally witnesses a political assassination, he is forced into a violent confrontation with modernity, and is ultimately killed by his own building. From neighbourly disputes over garlic-heavy cooking to memories of Ceaușescu’s heatless winters, this film explores the rich social and material universe of a Romanian apartment building. It follows the story of the block’s administrator, in his effort to mediate relationships between neighbours and maintain peace and order. The block comes to life, as its inhabitants constantly reshape it to defy the passing of time, while its failing infrastructure encroaches on their neighbourly relations. A contemporary glass library faces a roman temple. They are separated by 2000 years, a blink of an eye. Inside, space and time slightly tend to float. A beautiful visual portrait of a generic metro station in Quebec: a non-place, as defined by Marc Augé, where lives meet, cross and re-define the meaning of space. Echoing his exhibition in the Château de Versailles, artist Xavier Veilhan opens the doors of seven modernist houses, from California to Europe. Exploring the creative process, the artist appropriates the architecture and revives these iconic houses, thus offering a new and ultra-contemporary vision of modernism. This documentary features thought leaders in regeneration from around the world. Practitioners of Regenerative Design review key concepts, including living systems cultivation, placemaking, and the paradigm shift toward humans as positive actors on the ecological and social stage. AAFF2016 Public Nomination for Best Film, and Closing. 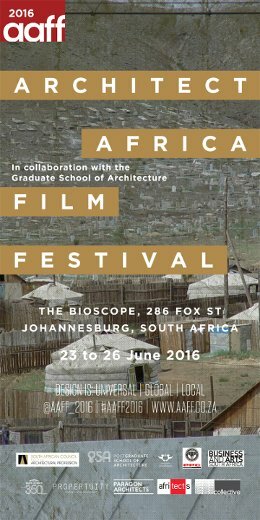 Unless otherwise indicated, all screenings and talks will be held at The Bioscope, 286 Fox Street, Maboneng, Johannesburg. 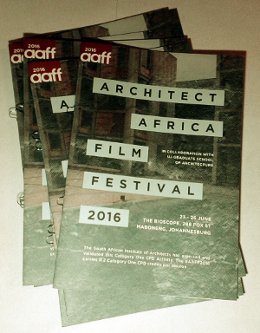 The AAFF2016 programme is subject to change without notice. The South African Institute of Architects has assessed and validated this Category One CPD Activity. The AAFF2016 carries 0.2 Category One CPD credits per session. To register your CPD credits kindly deposit your ticket stub together with your details in the CPD box at the theatre foyer. Please include the following details; full names, surname, SACAP registration number, telephone number and email address.